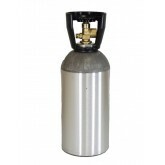 JTC Valve Sales carries Refillable aluminum helium cylinders that are lightweight and easy to transport. 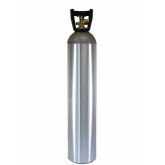 Our aluminum helium tanks are 40% lighter than steel cylinders. 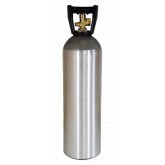 This polished aluminum, helium cylinder is the perfect choice for balloon decorators on the go. 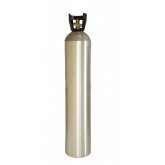 This cylinder weighs only 27 pounds and includes a handy handle to carry the tank that also doubles as protection for the valve. 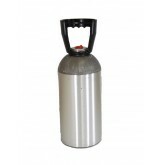 Each cylinder comes with a brass shut-off valve that will fit any compatible CGA-580 balloon inflator and when filled is capable of inflating approximately 110 - 11 inch latex balloons or 125 - 18-inch metallic balloons. 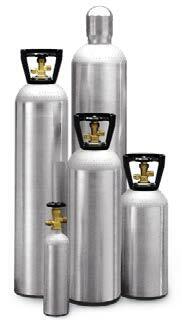 Every cylinder is produced from high strength aluminum alloy 6061-T6. 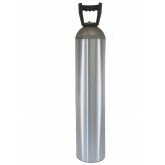 This tank is ideal for taking on small jobs or as an emergency back-up supply of helium. Since it is made from aluminium it is rust and corrosion resistant. 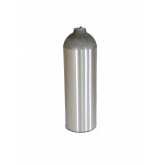 This cylinder is sold empty and can be filled at any authorized helium gas supply center. Please check prior to purchasing .You might need to own a transfer hose. 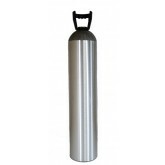 Which we sell as well to insure you can refill the tanks on your own. 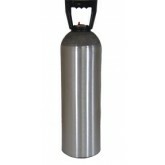 The purchase of one of our aluminum cylinders is a wise investment. These quality cylinders reduce your liability as a business owner, will provide years of service and, most importantly, insurers a safe work environment for you, your staff, and the general public when you go out on jobs. 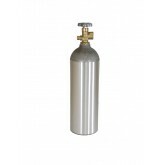 Cylinder is sold empty and can be filled at any number of authorized helium gas supply centers worldwide.